I opened the linen closet to search for a black skirt for my bed. Not knowing exactly which black piece of cloth it was I had to dig through quite a few things. When I finally found what I thought was the skirt I carefully pulled it out attempting to not disturb the mountain of other sheets, but after opening it up total dread came over me. I thought it was a skirt but after all it was a sheet. You are probably asking now, “Well why the dread?”. For the last 20 years I have had a full time housekeeper. Unfortunately for me, for the last four weeks my housekeeper has gone to Mexico to visit family. I am happy that she had the opportunity to spend some quality time with her family but remember I am an empty nester now as well. I don’t have any kids to make cleanup my house anymore! Yes I know you are still stuck on, “But why did you have all of the dread Dr. DeeDee?”. Well, the dread was not because I had to look for a skirt, the dread was not because my housekeeper was gone, and the dread was not because I am an empty nester. The dread was because it was a FITTED sheet!! I know some of you are feeling every bit of the dread I felt right now even though you are not presently folding a fitted sheet. LOL!!! Since I was the one to unfold it I had to be the one to put it back in place along with the pile of other sheets and skirts in the closet. Let me tell you the struggle was real folding that dumb fitted sheet. I was so befuddled that I just balled up the sheet and threw it back in the closet. Don’t judge me LOL! Prior to the dreaded sheet experience, I would have said you were probably there all the time and you just did the work of the ministry and you were never one with the Word. The four elastic corners of that sheet helped me to minister to her. Growing up my mother saw to it that all seven of her children knew how to fold not just flat sheets but fitted sheets. But I told you early on I have had a housekeeper for 20 years now and I have not had to use that skill. When I tried to use that skill it was a bit rusty so the level of patience became very low and frustrating. So it is with the Word! Something you once operated in and were very strong in can become something of the past because you have gotten away from it. So many people become desperate in the time of trials and tribulations because they have not operated in the Word on a daily basis. It is crucial that you always exercise your faith so you can build strong faith muscles. There is coming a day you will have to lift heavier than you are accustomed to. You must be prepared! Revelation 2:2 “I know your works, your labor, your patience, and that you cannot bear those who are evil. And you have tested those who say they are apostles and are not, and have found them liars; and you have persevered and have patience, and have labored for My name’s sake and have not become weary. Nevertheless I have this against you, that you have left your first love. Remember therefore from where you have fallen; repent and do the first works, or else I will come to you quickly and remove your lampstand from its place—unless you repent. Time to check where you got off course and get back on and never look back so you won’t forget how to fold those four elastic corners. Good Word, Dr. Dee Dee! HELP!!!!!!!!!!!!!!! In a new position at work and do not like the change. Insecure people get brand new on you in a minute. Thank God that I am secure in who I am and I KNOW who I belong and I know who my source is. Not only am I in a new position at work but getting ready to transition to serve at a new location. What the What!!! All I need is quality time with my Father to cry in His face…then I am getting up and speaking the Word over my situation. I question myself and this blog was good for me because I always need to make sure that I am in the right place with the right people. In transition………. I love you, Dr. Dee Dee! Thanks for being in MY life. You are funny! I know you have this. I love you too lady!! Thanks for being so real, the cares of this world pull on all of us different directions this is a wake up call for me. I loved this Dr.Dee, it reminded me of the saying “if you don’t use it, you’ll loose it.” So you as you were saying it’s very important to always exercise your faith so you won’t loose sight of operating in it. 💕 Love you. Thanks Dr. Dee Dee I receive this analogy it makes so much sense!!! I love your blogs and the responses connection is great!!! I love the analogy of the sheets! Dr. DeeDee, I recognized myself in that story, a different set of circumstances but the same terrible affect on me. I was left damaged with triggers. But God!! Recognizing my state, I’m pressing into God, refused to be a victim and defeated. I really appreciate your encouragment and counsel. I look forward to the next post. Wow Wow! What an analogy Dr. Dee Dee. Sho’nuff food for thought. That word was so on time for me. Thank you for hearing and obeying the voice 9f God. 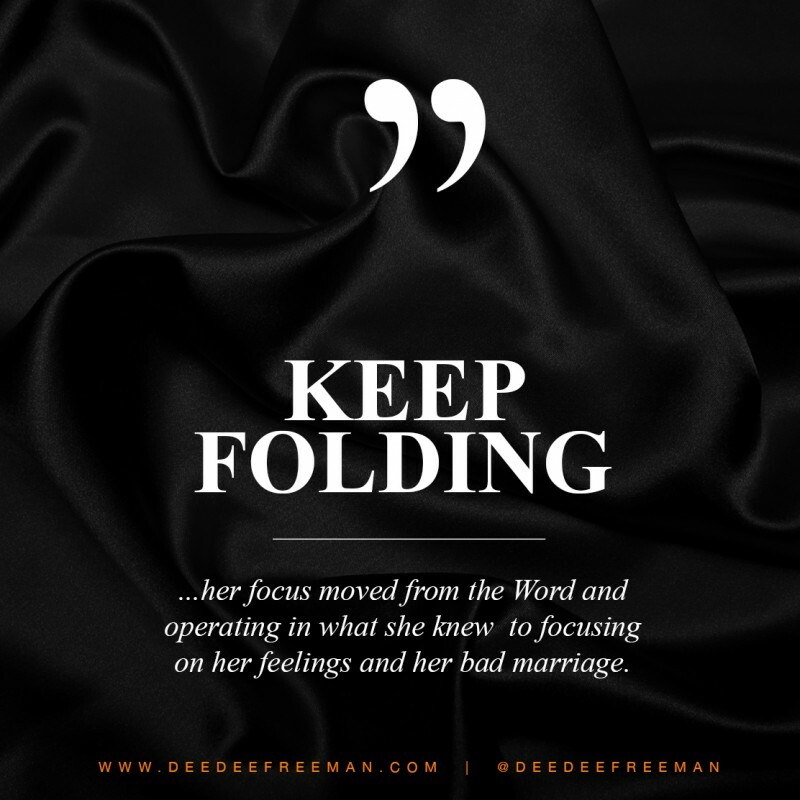 Thank you, Dr. DeeDee for such a poignant example (the skill of folding fitted sheets and exercising the use of the Word of God) to demonstrate our need to exercise the “muscles” of our tripartite being (spirit, soul and body)! Thanks Dr Deedee! Good message. Hello! I pray that the rest of your married days will be the best of your days. Stay encouraged! Thank you Dr. Dee Dee for the reminder I must always use my spiritual muscles. LOL!WOW this is so on time, because this was just me on Saturday! And I felt the same way you did Dr DeeDee, I dread folding fitted sheets, I remember my mom teaching me how to correctly fold those darn things before I left for college and til this day it is a battle I’d rather not even face, yes I remembered the steps yet simply put my patients was the bigger issue. Thanks for this reminder! Thank you Dr. Dee Dee. I really needed to hear that word today! Thank you for the positive message I really needed to hear that today. I have never met you but I plan to attend one of your events. This is good groceries!!!! I am so very thankful to you, Dr. Dee Dee! I have been challenged to become one with the Word – something that I’ve never heard before. But it has revolutionized how I study His Word. Love it!!! Thank you for this clear and practical example that can help us stay on the path that GOD has for us. Awesome read and a great reminder to put my eyes on His Word daily… get it in so that I can pour it out when I need it. Thank you Dr. DeeDee. I love the analogy with the fitted sheets, just because we know it doesn’t cut it. You have to be a doer also. Great perspective. Thank you Dr. Dee Dee for this reminder. It’s easy to get off focus, but if we just stay with the Word! I love you and thank God for your ministry! Dr. Dee Dee, Wow! You were definitely in the Spirit….that’s all I gotta say! Rich word building my FAITH MUSCLES 💪💪💪. Thank you for the great example of staying focused on Gods word and continuing to keep our Faith. I first want to pray for that sister that God will fill that void in her life with that she know she is most deserving of. I also pray she will find her way back to the only way and that is to stay in the word. I my self know that you can definitely get distracted by the ways of this world which can only lead to discouragement. We must always keep Him first. Focus on Him and His word and let Him carry you through. Faint Not! Thank you for this post! I can definitely relate, as I found myself in the woman’s shoes a few years ago. I had gotten so down about a certain area in my life and I wondered how I got there. As I reflected, I realized that I had gotten away from my daily faith confessions. That seemed like something small, but by doing those confessions every day, it helped strengthen my faith. I would witness with boldness, pray with boldness, and encourage others at the drop of a dime. Then I got to a point when I hardly even opened my mouth to minister to someone. I was focused on me and my issues all the time and was often discouraged. Anyway, I’m getting back to my position of strength! Thanks for this word! Thank you Naomi for sharing. Im happy that you are finding your way back. Im praying for you! Dr Dee Dee, your blogs are awesome! I’ve been able to take something away from each one you’ve written thus far. It never hurts to do a personal inventory and see what we can improve on. Thank you for that reminder! I love how you take something so simple and use it as a teaching method. Not only made me laugh but it also made me think…and I got a lesson out of it. Keep these blogs coming Dr. Dee Dee I love them! I must repent and turn from what I know does not please God too. Those things like, gluttony, my temper, not spending that quality time with him due to being busy and caring for others…(Elderly Mom) My brothers and sister have to do their part too. (Let’s all pray for them) In the mean time I still have to do what needs to be done for Momma. (No regrets here. It’s a honor) However, returning to my first love. I mean really returning back to him is more important than anything that I will ever do. So having said that I repent publicly and privately…It’s time to really seek his face again! I’m loving your blogs Dr. Dee. They help me to settle down and see whats going on around me and inside of me. Keep them coming Pastor Friend, Sister Friend, Girlfriend. You are all that to us. We love you and most important what our God is doing in and through you. Favor is Fair! Wonderful read….. I never mastered the elastic corners, but I am so glad I get the point. We have to stay connected to the Word, who is our source. God bless you Dr. Dee Dee for this message so needed at this moment. Thank you for letting God use you to speak our spirit. In 2013 I went through a lot in my life. Each after that it seemed like I just couldn’t find my footing. I can truly relate to my sista in this message. This message spoke to my spirit and I felt the pressure released. Now I can walk tall again and refocus my thoughts on the mission God have for me. Awesome word Dr. Dee Dee. Love this Dr Dee. So Good. Thank you. My pastor emphasized a few weeks ago, “ready for anything”. This is if we stay focused on God! Thanks Dr. DeeDee for allowing the Lord to use you. I have been following you and Pastor Freeman for the past 3 months, but have not visited yet. I am this woman and as much as I tell myself and others that I’m good, I am not. This message has confirmed that. Today is the beginning of the rest of my life. I am running back to my first love. I must get my fire back and not dwell on the past, but grow from it. Continue to be an open vessel. I await the opportunity to join you at one of your Infusions.